The third-quarter results are in -- and Home Depot showed why it is the dominant force in the home improvement retailing industry. Investors are grading Home Depot (NYSE:HD) on a curve. The company is posting growth that puts other national retailers to shame. Its profitability is soaring, too. And yet, Home Depot is one of just four members of the Dow that are trading lower so far in 2016. One driver behind the stock price disconnect is the fact that the home improvement industry is growing at a much faster pace than other consumer-spending categories. That's why it's not fair to judge Home Depot's latest 6% comparable-store sales gain against Costco's 1% uptick, for example, or the flat result that Target just managed. It's more revealing to stack Home Depot up against its key competitor, Lowe's (NYSE:LOW). In that match-up, the company just demonstrated why it is the clear leader in the home improvement industry. The market for home improvement spending is rebounding nicely off the lows that it hit following the 2008-2009 housing market slump. Americans are now pouring about $700 billion per year into remodeling, improving, and building their homes -- up from a $400 billion pace in 2011. Yet Home Depot is capturing more than its fair share of that surging market. Its third-quarter comps figure was 6%, which marked an improvement over the prior quarter's 5% gain. In contrast, Lowe's grew its U.S. sales by 3% in the third quarter. The same trends are evident when you look at the longer term. Home Depot is on track to grow comps by 5% this year, while its smaller rival sees gains weighing in at between 3% and 4%. LOW Revenue (TTM) data by YCharts. That consistent growth gap has allowed Home Depot to expand sales at a faster pace than Lowe's over the last five years even though Lowe's is aggressively adding stores to its retailing footprint while Home Depot hasn't launched a new U.S. location in years. Home Depot is extending its profitability lead over Lowe's. Operating margin improved to 14.5% over the last nine months from 13.7% in the prior year period. For Lowe's, that figure is 8.3%, or down slightly from the 9% it managed last year. This is another long-term trend that separates the two retailers from each other. 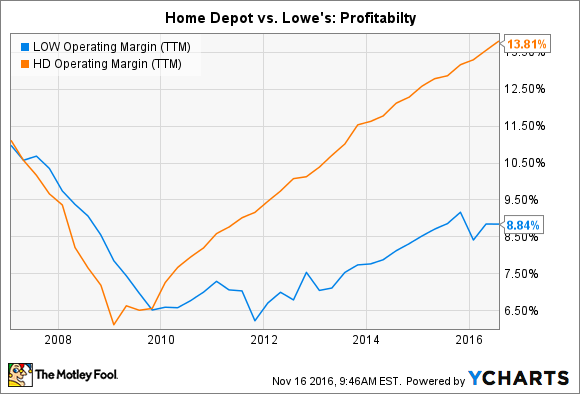 Since the bottom of the housing market crisis, Home Depot's operating margin has more than doubled while that of Lowe's has barely improved. You can see evidence of that profit gap continuing through the rest of this year, and beyond. Home Depot, after all, raised its earnings guidance for the third consecutive quarter and now sees profits jumping 16%, to $6.33 per share. Lowe's, in contrast, said sluggish sales results in August and September "put pressure on our profitability in the quarter." Management is now looking at additional ways to cut costs so that the company can hit its overall earnings targets. Both Lowe's and Home Depot stocks dropped immediately following the companies' third-quarter reports this week. Investors wanted to see stronger growth from the retailers, given the healthy rebound in the housing market. Home Depot has been hit especially hard as Wall Street worries about slowing customer traffic gains. Customer growth has slowed to a 2.5% pace from the 4% surge it enjoyed over the last two years. But compared to other major retailers, its results are in an entirely different category. 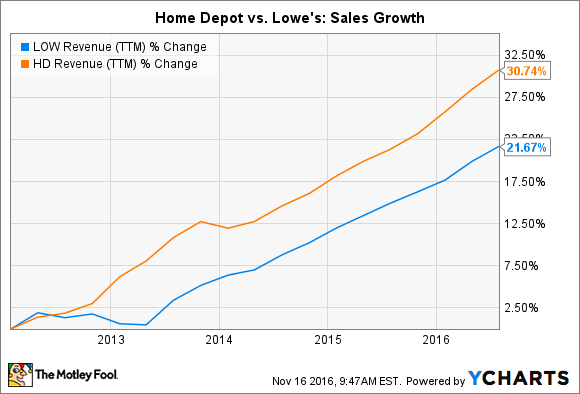 And even within its fast-growing industry, Home Depot is setting the bar for balanced sales and profit growth.